IS THE QUEEN STILL HIDING? Tickets are available every day at George’s from open to close. Tickets win be sold up until 7:45 PM on the day of the drawing. Should the Queen remain in hiding, the next week’s tickets will be available immediately after the drawing. The Queen’s Court (Parents Club) win also be selling tickets at most home games, Open House, and other school events. You can also simply ask or email any member of Parents Club if you are interested in purchasing tickets. Drawings every Thursday at 8 PM and Tickets are 6 for $5 – CASH ONLY. You must be 21 or older to play and/or attend the drawings. The “Queen of Hearts” is a progressive raffle. The first drawing will be Thursday, January 24 at 8 pm at George’s on Belmont. Only 1 ticket will be drawn each week. Winner need not be present. When the drawing falls on a holiday, we will freeze the drawing until the following Thursday. St. Celestine reserves the right to adjust the drawing dates based on St. Celestine School and Parish events. A game board containing 54 cards including two jokers (numbered and sealed face down) purchased from a certified gaming vendor will be displayed at George’s in a secure location with the Queen of Hearts as the “Jackpot Card”. Tickets are 6 for $5, with no limit on the number of tickets that can be purchased. All tickets sold are single stub tickets so you must print your name, phone number and CARD number to turn over on the back of each ticket. Once the correct information is written on the ticket, return it to the bartender OR person running the Queen of Hearts for that drawing, to be placed in the raffle cylinder. No single tickets will be sold. All players must be 21 years of age. 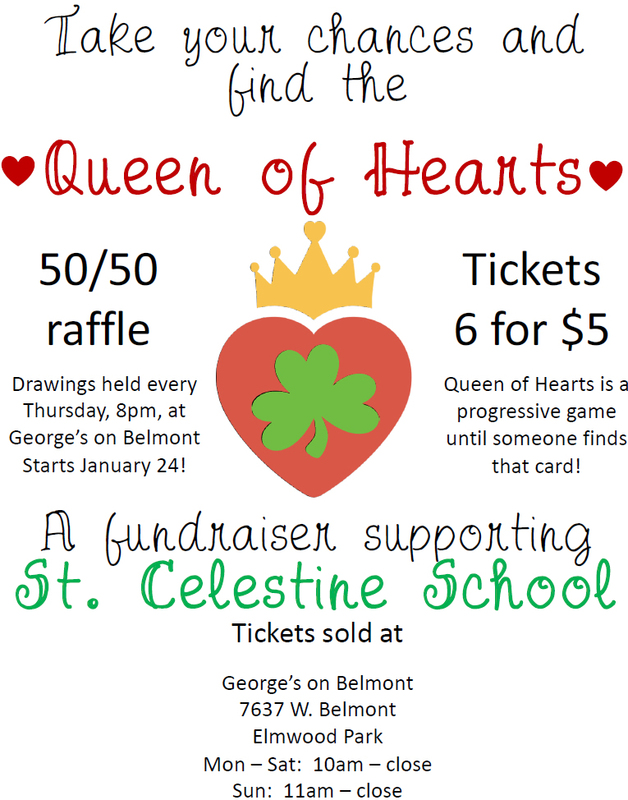 The Queen of Hearts drawing will occur every Thursday evening at 8 pm with one card being drawn each Thursday, beginning January 24 at George’s on Belmont. If the Queen of Hearts is NOT chosen by the holder of the ticket then the prize money will be carried over to the following Thursday. All the tickets will be removed from the cylinder and be destroyed. New tickets will be available for sale immediately after the drawing for the following Thursday. If your name is drawn, and you are present, you will automatically win $100. The card number written on the ticket will be flipped. If the card flipped is the Queen of Hearts, the winner will receive fifty (50%) of the jackpot. The remaining 50% will go to St. Celestine School. There can only be one name per ticket. Write your full name, just as it appears on your driver’s license or social security card, telephone number AND the card number you are requesting. Do not use nicknames, initials, group names or abbreviations as this could cause complications when collecting winnings. Stickers or labels shall NOT be used. If a ticket is pulled with a sticker on it, it will be deemed invalid. If a person does not put a number on their ticket, the ticket will be thrown out and there will be an automatic rollover. No award money will be distributed. If a ticket is pulled and it has a number that has already been taken, the ticket will be thrown out and there will be an automatic rollover. No award money will be distributed. If a blank ticket is drawn from the cylinder, the ticket will be thrown out and there will be an automatic rollover. No award money will be distributed. Should this raffle go the full 54 weeks and when we pull the last ticket it has an unavailable card number on it, we will pull another ticket. The cap for this raffle will be a $100,000 pot, with a maximum payout of $50,000 going to the winner. All winnings over $600 are subject to taxes being removed. If a prize of greater than $5,000 is awarded, the winner will need to confirm their identity and SS number by completing and signing an IRS Form W-2G. In addition, IRS requires a withholding of 28% of the winnings less the amount of the wager. Winnings will not be distributed until the W-2G has been completed and signed. If a player is unwilling or unable to provide any of the listed items, the prize money will revert to the school. This may take up to two weeks. A winner cannot donate the prize without first taking ownership of the prize, which means the appropriate W-2G must be issued and the appropriate withholding taken. If a winner then wants to donate his/her prize, then he/she can do so. Tickets will be available for purchase every day at George’s from open to close. We will also be selling tickets at various school functions as well. Ticket sales on drawing days will end at 7:45 pm sharp and all tickets must be placed in drum by 7:50 pm. If you do not agree with the rules of this game at this venue, there is no obligation to play. The Queen of Hearts Committee reserves the right to amend these rules as needed prior to any week’s drawing. The Committee also retains the right to change the date of the drawing as needed.